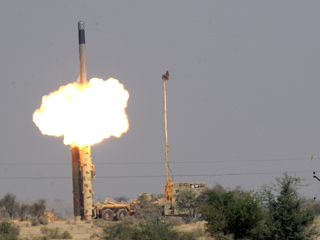 JAISALMER, RAJASTHAN: The Indian Army on Monday successfully test fired an advanced version of 290 km range supersonic cruise missile BRAHMOS as part of a user trial at Pokhran test range in Rajasthan. The missile was launched by a Mobile Autonomous Launcher deployed in full configuration with mobile command post at the ranges. "The launch was successful and the missile hit the designated target," Defence Spokesperson Col S D Goswami told PTI. Senior Army officials witnessed the launch and congratulated the operational team for its successful launch. Both the Army and Navy have already inducted the missile, developed by India in partnership with Russia.